The Solardomes and Ozone Field Release System at CEH’s Bangor site is used to research the effects of air pollution, particularly ozone and nitrogen, on vegetation such as crops, trees and grasslands. 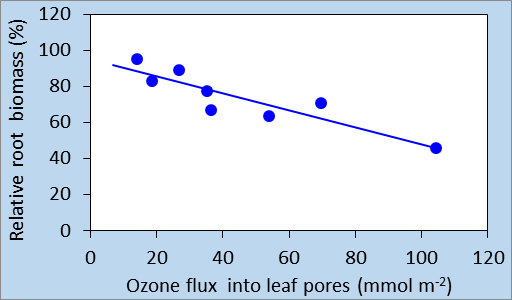 Eight hemispherical glasshouses ("solardomes") in which vegetation is grown at different ozone levels, ranging from pre-industrial to future predicted elevated ozone levels. Nine free air ozone exposure (FAOE) rings in which vegetation is grown at ambient and elevated ozone levels. Ground-level ozone is not only an air pollutant, it is also a greenhouse gas, contributing to global warming. Background ozone concentrations are rising and average levels are now above thresholds for adverse effects (e.g. reduced growth, leaf damage) on vegetation in many areas of the UK. The facility enables the study of interactive effects of air pollutants and a changing climate, such as warming, increased drought and flooding. Critical thresholds and tipping points for vegetation can therefore be established. 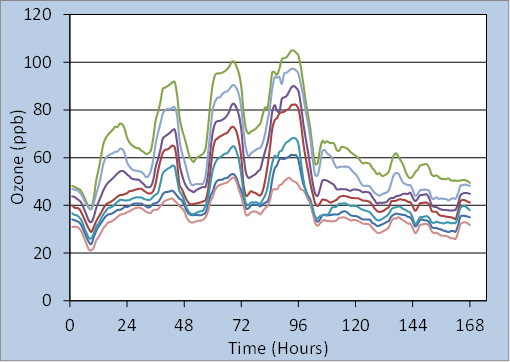 Each solardome simulates different ozone levels at high precision. Ambient air is filtered through charcoal and then injected with controlled amounts of ozone, using Labview software with a constant feedback from the points of release. All domes are ventilated at a rate of two air changes per minute. Three FAOE rings are exposed to ambient air, whereas the other six rings are exposed to ambient air (‘control’) and two enhanced levels of ozone, with varying release rates according to wind speed. Temperature, humidity and photosynthetic active radiation are also monitored in both systems. Scientists at CEH's Bangor site coordinate the International Cooperative Programme on Effects of Air Pollution on Natural Vegetation and Crops (ICP Vegetation), a major international collaborative project that reports to the United Nations. Results from the Solardomes and field release system are combined with results from other ozone monitoring studies, particularly in Europe but also other parts of the world (e.g. North America, Asia), to map impacts of ozone on vegetation. Field-based evidence from these studies enables policy-makers in Europe to assess the effectiveness and sufficiency of current air pollution legislation for today and in the future. Scientists from Bangor are also contributing to the Global Tropospheric Ozone Assessment Report. Examples of recent research papers describing experimental results can be found here (PDF).